Hi there, my name is Bella! 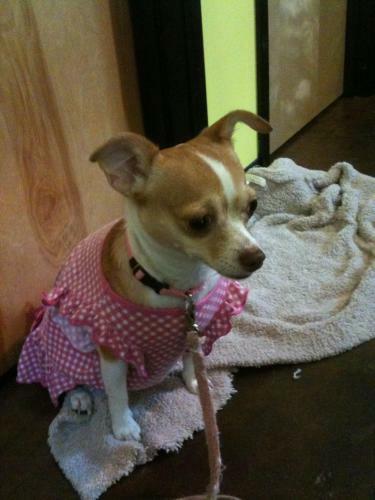 I am a sweet and cuddly 2 year old Chihuahua looking for home sweet home! Did I mention I was beautiful? That’s what the name Bella means afterall! And you can see I am quite the fashionista. I would love a home where we can curl up on the couch together, do each others nails and watch Project Runway. Remember that episode in Season 3 where they designed for dogs? Ha! That was the best! Those were such lucky pooches, not just because they got to walk the runway but also because they had humans that clearly adored them. Do you think you might be able to adore me? If so please fill out an application so we can schedule a meet and greet! I am fixed, vaccinated and microchipped. My adoption fee is $180. I am currently living in foster care.